A more detailed, resource-rich, interactive Save Upper Campus website. The varied habitats of UCSC campus harbor well over 500 species of wild plants and 500 species of mushrooms—and more continue to be discovered. Some species only grow in one or two small areas and could be eliminated from campus entirely as a result of development-related impacts. At least 12 species of plants have already been extirpated (made locally extinct) from campus lands since UCSC was founded. Just under 50 mammal species are known to inhabit campus lands, including the Long-Tailed Weasel, American Badger, and Ringtail Cat. Upper Campus is bordered by open space parkland and forms a vital wildlife movement corridor for secretive species such as the Mountain Lion, Gray Fox, and Bobcat. Any development in Upper Campus would disrupt animal movement, increase vehicle-animal collisions, and eliminate habitat. Upper Campus forms the headwaters of three ocean-bound streams—Moore Creek, Cave Creek, and Jordan/Bay Creek. Any development in this upper watershed area will lead to polluted runoff and erosion/sedimentation, impairing downstream water quality and endangering sensitive aquatic species including the Red Legged Frog, Southwestern Pond Turtle, and California Giant Salamander. UCSC campus encompasses a unique system of karst caves, home to an astounding array of organisms including over 70 invertebrate species, six of which are not found anywhere else and two of which are federally-listed Species of Concern. The cave system floods during high winter flows, and cave species could be harmed by an increase in sediment and polluted runoff from parking lots and buildings. The LRDP proposes adding 54 acres of impervious surfaces (parking lots, buildings, roads) to the Cave Gulch watershed, which currently only receives runoff from 7 acres of campus. A recovering population of the threatened Central Coast Steelhead currently thrives in Wilder Creek, which receives Cave Creek as a tributary. According to the State Parks’ Wilder Ranch Freshwater Fish Study, "the greatest potential threat to aquatic habitats is from existing and potential future development in upper watershed areas outside existing park boundaries." Campus lands were inhabited by Awaswas Ohlone people until as recently as 200 years ago. Campus archeological reports document village sites, burial grounds, shellmounds, a dance house pit, hearth features, shell beads and evidence of bead manufacturing. Upper Campus contains Ohlone sacred places and these places continue to be held sacred by contemporary Ohlone people. The majority of Upper Campus has never been surveyed by archeologists, and therefore we cannot know the full extent of what is threatened by future development-related impacts. It's not just redwoods! Upper Campus is a striking patchwork of unique habitat types including knobcone pine forest, mixed evergreen forest, northern maritime chaparral, redwood wetlands, karst caverns, coastal prairie, meadow wetlands, and dwarf redwood forest. Tree species in Upper Campus include California wax myrtle, golden chinquapin, ponderosa pine, big-leaf maple, Pacific madrone, tanbark oak, shreve oak, and douglas fir. About 50 acres of northern maritime chaparral could be removed for development, according to the LRDP EIR. This is a rare plant community growing only in the summer fog zone of the central CA coast, and the UCSC campus chapparal forms a significant portion of its statewide range. Up to 54% of Santa Cruz Manzanita on campus could be removed. It's an endangered manzanita that only occurs in the SC Mountains. Many aspects of campus ecology remain unknown or poorly understood. For instance, the extent of the cave system underlying the lower campus and the flow of water between springs, swallowholes and underground passageways remain largely mysterious. Multiple species new to science, such as the Ohlone Tiger Beetle and Empire Cave pseudoscorpion, have been discovered on campus in recent years. Others, such as a peculiar sedge growing in the seep zone and a blind and pigmentless cave-dwelling form of the California Giant Salamander may be new, distinct species, but need to be further studied. Dusky Footed Woodrats, reclusive builders of towering stick-dens, are considered a keystone species because many other forest species rely on their masterfully constructed nests for shelter and insulation. The LRDP EIR estimates that proposed development would "result in the removal of roughly a quarter of the [woodrat] nests in the north campus." The San Francisco dusky-footed woodrat is listed by the Department of Fish & Game as a species of special concern. Thirteen elusive bat species occur on campus, and eight of them are of "special status." 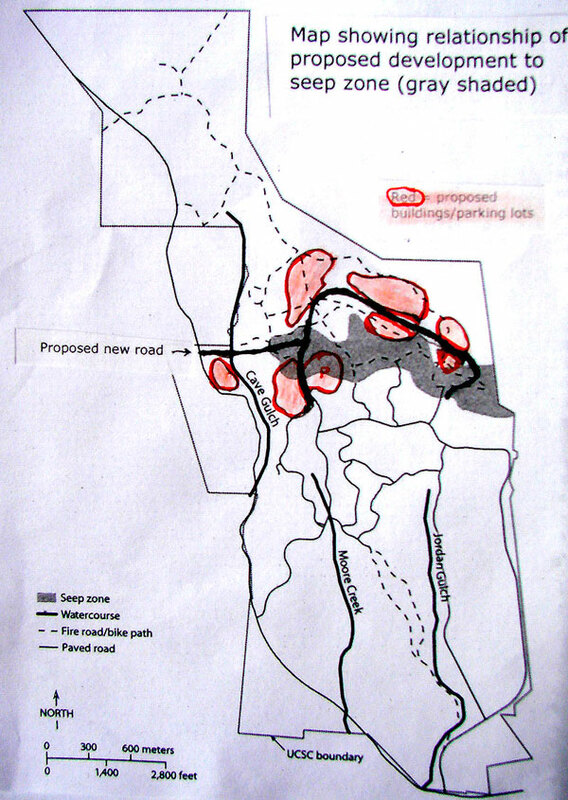 The LRDP EIR states that proposed development "could result in a substantial adverse impact associated with the disturbance of roosting sites for special status bats" and that north campus contains quality bat foraging and roosting habitat that is "contiguous and substantially less impacted by development than the central campus." In general, bats are negatively affected by human disturbances such as light, activity, and noise pollution. The EIR postulates that "bats roosting in the north campus may be more sensitive to disturbance because of the lack of development and relatively low level of human activity in that area." Though a relatively small amount of development is proposed directly on top of the Seep Zone of Upper Campus and this area is touted in the LRDP as a natural reserve, planned development in would entirely surround this special area with a new loop road and campus facilities. In the middle of a bustling new section of campus, the seep zone area would undoubtedly be degraded and trampled by a huge increase in foot and bicycle traffic. Additionally, the flow of water would be impacted—Environmental Studies professor and restoration ecologist Karen Holl states, "With the extensive proposed development, the drainage patterns into the seep zone will be altered which will affect the ecosystems." 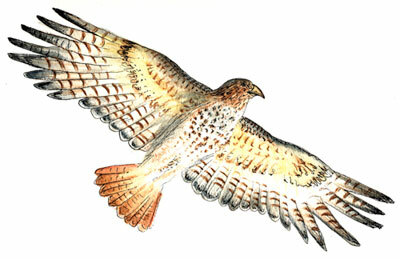 Special-status raptors including the golden eagle, sharp-shinned hawk, northern harrier, long-eared owl, and white-tailed kite hunt on campus grasslands and are known to nest in the forest of Upper Campus. The LRDP's EIR states that "approximately 98 acres of grassland area within which special-status birds have been observed foraging" could be potentially lost to development. The EIR also states that development in forested areas could result in "loss or abandonment of active nests for special-status bird species." According to the LRDP EIR, "Up to 1.5 acres of coastal prairie could be lost to campus development under the 2005 LRDP. Impacts would occur at one location north of the Crown/Merrill Apartments, where new development may disturb or remove the eastern edge of the Crown Meadow (AKA 9/10 meadow). Development of coastal prairie at Crown Meadow also may degrade the community adjacent to the disturbance through increased human presence (e.g., trampling, bicycles) and spread of invasive weeds." Coastal prairie is home to native bunchgrasses and many wildflowers, and is also a critical habitat for many threatened species. A 2002 UCSC Campus-Wide Habitat Assessment for the Ohlone Tiger Beetle identifies the Crown Meadow as one of few local sites suitable for the endangered Ohlone Tiger Beetle to potentially establish a population in the future. Development would likely extinguish that possibility. When the LRDP’s Draft Environmental Impact Report was open for public comment in 2005, Environmental Studies faculty, local biologists, and local regulatory agencies submitted numerous highly critical and detailed letters, assailing the EIR for it’s copious errors, omissions, vague language and inadequate mitigation measures. A few of the most glaring errors were corrected, however, many significant issues that commenters raised were summarily dismissed before the EIR was certified by the UC Regents in 2006. These comment letters remain an excellent source of information about campus ecosystems. To read a two-page summary of key remarks from local biologists, look here. "It is my firm belief from many years of careful examination of UCSC that the current level of development has exceeded the campus’ institutional, physical, and biological capacity. The signs are everywhere: unfunded mitigations, eroding hills, and disappearing species. ..It is unethical that those in power choose to move forward with these plans: if all others were welcomed to act in such a way, our infrastructure, water resources, and natural lands would be in serious peril."